Recently named one of the ‘Top 3 cities to visit worldwide’, Liverpool Buy to Let property is a hot topic. Offering some of the highest yields in the country for Buy to Let investors, the city is the ideal location for both young professionals and students alike. The Courtyard at X1 The Quarter is a prime residential site, with views of the Marina and only a short walk into the city centre. Already in construction, finance options are available and investors are offered an assured 6% NET rental yield for the first five years. 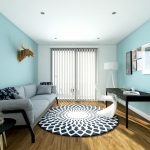 With a proven rental demand in the area and an experienced management company in place, interest in this development is already high and investors are advised to enquire early, in order to secure the best units.